As I’ve mentioned before, Alan is the minimalist and I’m the maximalist but our styles are similar and we can generally agree on how to style a space. 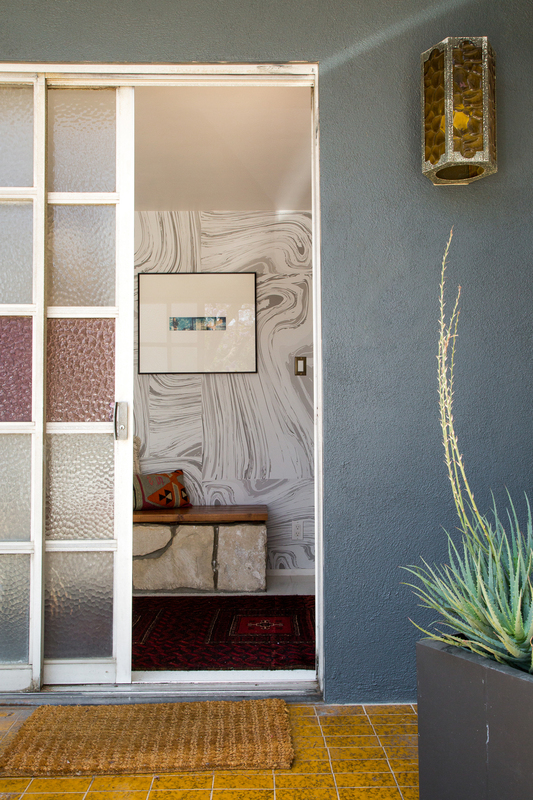 We knew we wanted to create a unique, happy, and creative entryway when we were renovating the house. My Mom asked, “What will you do when you get tired of all the color?” I said, “We’ll change it out!” The base of the space is very neutral with the terrazzo quartzstone tile and the Crystalline wallpaper. We kept the walls and the flooring in white and gray tones, to allow the wood bench and Palo Verde stone wall and planter stand out. 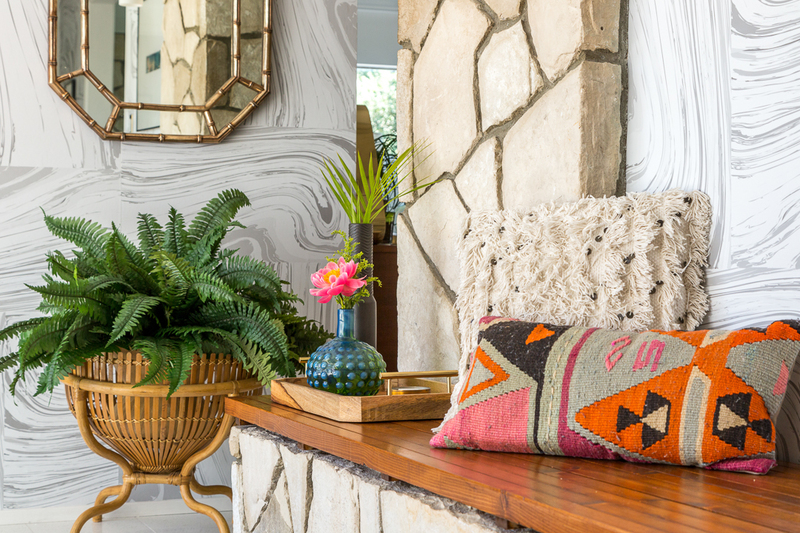 The rug, pillows, and other “flair” adds that personality I crave and love so much in a space. What can I say, I want to make Justina Blakeney proud of this space! For those of you who follow me on Instagram stories know that I found that rattan basket planter at the Flea Market. There were scarves and bags in it and the vendor was surprised when I wanted to buy the basket and not the goodies. I got it for $25 and I wasn’t sure how I’d use it but I knew it would come in handy. I considered using it as a basket for Harlee’s toys or blankets, but it looks so great as a planter right? One of my favorite things about our house is the sliding glass doors. This was a custom doorway made for the house and it’s just so unique and pretty. When Alan and I visited the house the first time, we didn’t even realize the front door was a sliding door as the realtor had opened up the house. We didn’t figure it out until we became happy (and overwhelmed) homeowners and finally got the keys to the house. There was tons of drama trying to fix the lock on the door (you can read about that here), but we got it resolved and I’m still in awe of this door! Add lots of plants and greenery in various heights, colors, and styles. Ferns get a bad reputation but it’s an amazing plant that will survive even under the most horrid conditions. Snake plants are also a good option if you have a black thumb! Rattan is your friend. Don’t go overboard with it, but find some key pieces such as a coffee or side table, large scale mirror, or planter. Don’t be afraid of mixing styles. You can mix in Hollywood Regency with mid century modern pieces to achieve that eclectic, worldy feel. Edit to add pieces, and to remove pieces that make the space seem off! Such a modern bohemian look! I am really digging the set up! Def will have to refer back to this when re decorating! I am in love that mirror! This looks so good! This decor is so up my alley! Wow this is absolutely gorgeous!! Love the details!! Gahhh…looks like a magazine spread! You do such a beautiful job with your home and I SO need your skills! You are so talented! 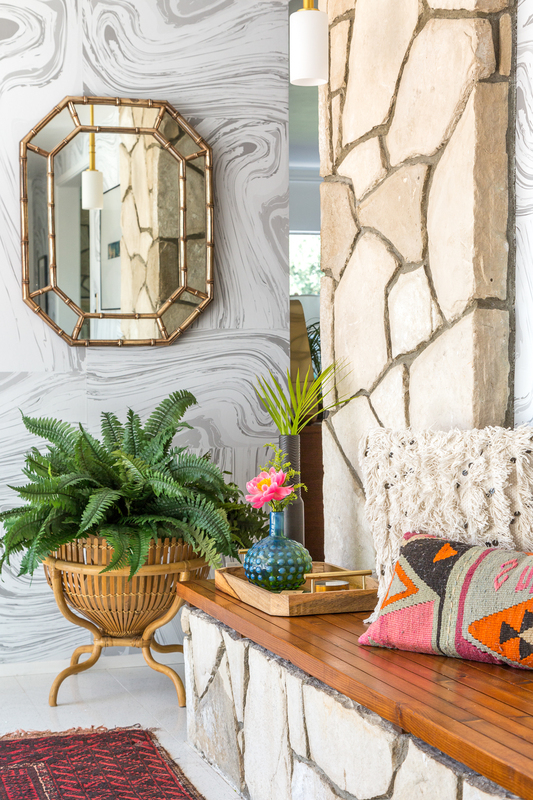 Love this boho vibe! Fab soft neutrals with fun pops of color. Such a peaceful addition to have the greenery…beautiful space! This is seriously such a gorgeous space! 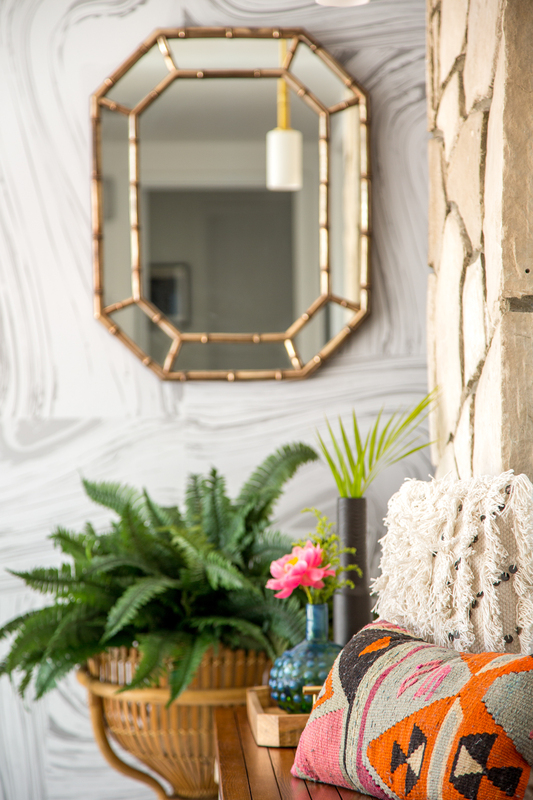 I adore your style and decor – fabulous job girlfriend! Your home is so well curated and cozy! I love how chic the pieces are and how well the colors work together. Okay this is STUNNING! 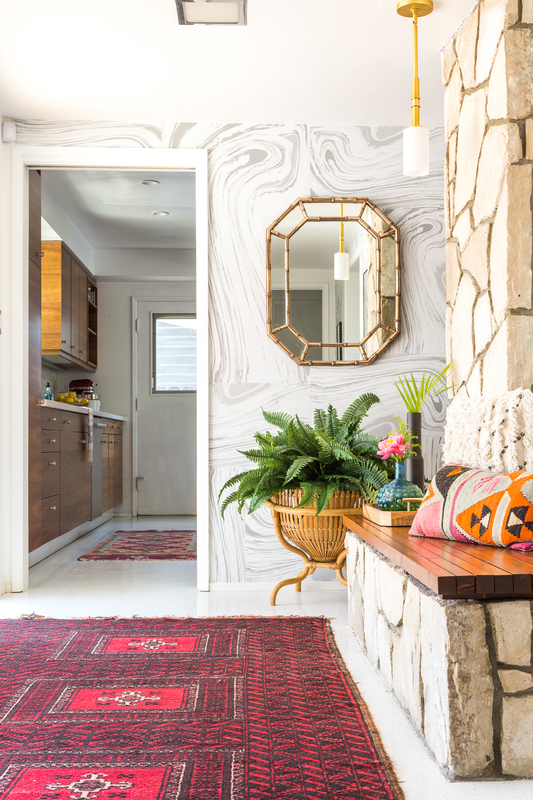 I need everything about this entryway in my home! I’m obsessed!